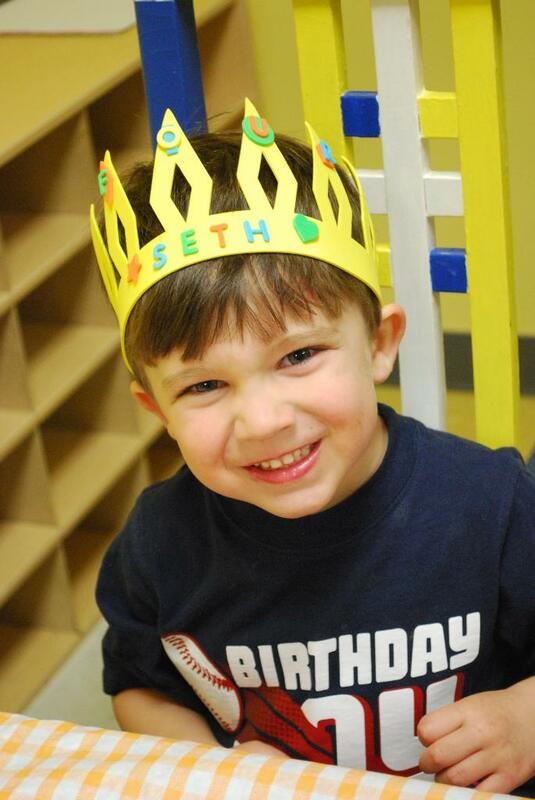 Seth at Four Years - Such a Big Boy! 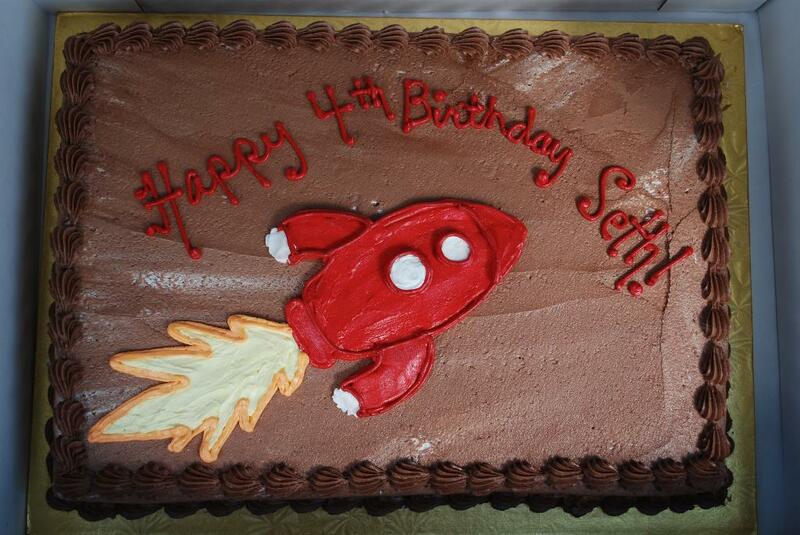 How did Seth get to be four years old? The time goes by so fast. He had a great time at both of his birthday parties this year. The party for his Tiger School friends at Bounce Town was so much fun! He was so excited to be the "guest of honor" - finally the birthday boy at Bouncetown! And there was a lot of bouncing done! Seth was so cute sitting at the head of the table with his birthday crown on. He was very excited about his rocketship cake! We had chosen that as the theme for his party when we picked out his invitations, and it's been fun to see how interested he has become in rocketships! Some of his favorite gifts were rocketships! He had a great time at his "grandparents"/Mother's Day party, too. It was fun to all be together and celebrate Seth. We've noticed that Seth has been making lots of "big boy" developments. Lots of potty developments lately. He's been fully toilet trained for the last few months, even at night. We leave his potty up in his bedroom in case he has to go in the night or right when he wakes up. Up until now, he wouldn't get out of bed by himself, but recently, if he really has to go, he will get up by himself, use the potty, and get back in bed! He has also decided that he wanted to start peeing standing up (like his friends) and all of a sudden, he was a pro! The newest development is that he has started using the fly in his underwear instead of pulling them down. We were pretty amazed that he decided all this on his own! Seth has made a lot of strides in his swimming skills - we've been doing some weekly lessons through the winter and spring with his daycare teacher, Kelly. With Kelly's assistance, and the key technique of pulling on his "magic string" (tie on his bathing suit), Seth learned to float by himself on his back. He was able to do it for up to 20 seconds - he was so proud of himself! Now he is working on blowing bubbles, putting his face in the water, and floating on his front. We are looking forward to more swimming lessons this August. 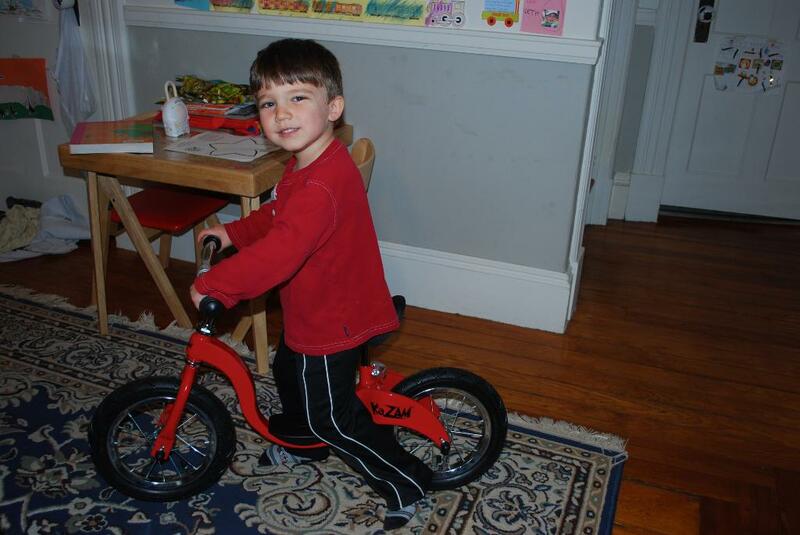 Seth has been able to ride his tricycle on his own - pedaling had been hard for him. Of course, blowing up the tires and adjusting the seat helped! He's already really gotten the hang of his balance bike, and can zoom around on it! Seth has also matured a lot in his interactions with Evan. 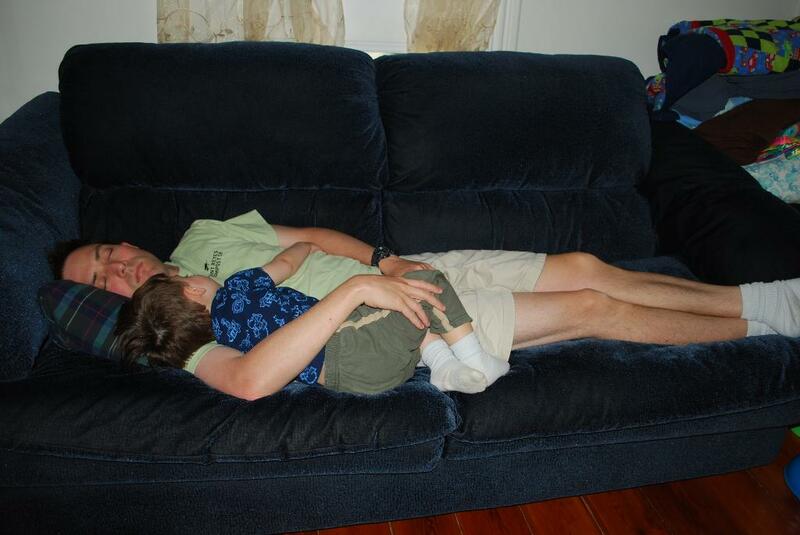 He understands now about the importance of sharing with Evan and taking turns with Evan. Now the frustrating part for Seth is that Evan doesn't understand sharing! So we've been working on explaining to Seth that he has to be the better sharer for a while until Evan understands better. He always wants to hug and kiss Evan, and the two of them get into these laughing/running fits that are quite hilarious. Seth likes to help us teach Evan new words and signs, and he likes to teach Evan new skills like stacking, building, etc. We've started reading "chapter books" together. Favorites have been the Frog and Toad books, Winne-the-Pooh, and The Mouse and the Motorcycle. Seth can remember what has happened from night to night, and it is fun to look forward to all the reading in store for us. Seth has continued to excel in Tiger School. All the routines are old hat to him now, though at times he does test the boundaries and needs to be a better listener. We are working on this at school and at home, and Seth is usually very receptive to consequences and talks. We've done sticker charts, and these seem to motivate him. He's interested in a chore/allowance chart, so we might work on that this summer. At Tiger School, his teachers have challenged him so much, and we're excited for him to return for another year next year. This winter and spring they've covered topics including Valentine's Day, teeth ("molars are for crushing"), Presidents' Day, Pajama Day, Dr. Seuss's birthday, St. Patrick's Day, frogs, kites, turtles, rain, rabbits, a huge rainforest theme, forest floor unit, plans, rocket ships, and the ocean! He comes home with all this information that he remembers - the stages of a frog hatching from an egg, talking about bromeliads (I had to look this up - flowers in the rainforest) - he really is able to process auditory information and keep it in his little head. He made his own little book about frogs - very cute! 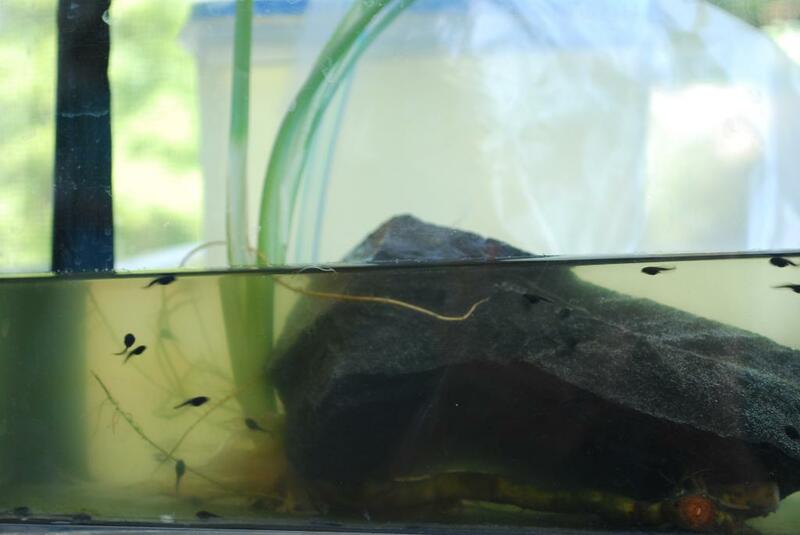 He was so excited when Aunt Michele and Uncle Bill gave him a tank of tadpoles for his birthday - we can't wait until they turn into toads. I had fun going into Seth's Tiger School class one day to read some of our favorite books about the rainforest - it was so much fun! He is making lots of strides with letter sounds and even a couple sight words (STOP, NO, SETH, EvAN), and can count to 30 when looking at a calendar. He can understand some basic addition facts, too. Can't wait to see what he'll learn next year! Seth has been enjoying coming up with project or craft ideas and following through on them. We had been planning on planting a rainbow garden ever since he got that book from his friend Elizabeth for his 3rd birthday. So we did it! We went to a garden show and got all the rainbow colored flowers, and then with huge help from Geema, we planted the garden! We look forward to more projects like this! Even though Seth is such a big boy, and doesn't nap anymore, on occasion he will still fall asleep in the car, or better yet on one of us. He'll snuggle up with us, just like he did when he was a baby. We're hoping he doesn't give this up anytime soon. For Winnie the Pooh's home, the 100 Acre Woods - "No Mommy, it's 100 ache of woods!" Still acquiring new words - damaged, pain, persevere. He's always very interested in what new words mean. So cute to hear him answer the letter/word questions on one of his favorite shows - Super Why. After telling Seth we always love him, "But Mommy, when I'm married, I won't get to stay with you!" "Mommy, do grown-ups find kids' shows boring? Lately he has been very interested if Tooth Fairy, Easter Bunny, Santa Claus are real. We've told him that some people think they are and some people think they aren't, but he'll never see a real one. Hard topic. He seems to accept this for now. "I'm the boss of cake!" He's working on a good maniacal laugh! Since turning four, Seth wonders when he'll be old enough to do certain things, like camping, lose a tooth, or climb a tree by himself. Calls his tadpoles his "fishy friends"
Insists on calling metamorphosis "metamorphosA"
When reminiscing about watching Baby Einstein videos since we've been watching some with Evan, he said "I enjoy being a kid!" Described his soft moondough as feeling like "bedtime blankets"
Seth: I want to be married to Evan when I grow up. Us: Wow, well you're Evan's brother, so you'll already get to spend a lot of time with him. Seth: Then when I grow up and get married to a mommy and we have children, I want Evan to be part of our family, and when the mommy and me go out, Evan can take care of our children!